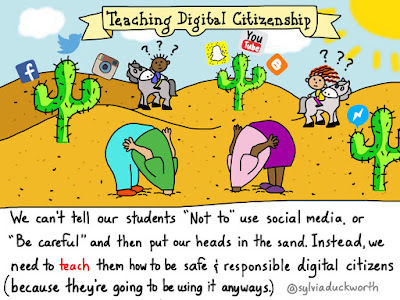 A few weeks ago I came across a tweet shared by Linda Wearne that contained an incredible image regarding the need to teach Digital Citizenship and proper social media usage in schools. The image, seen below, was created by the very talented Sylvia Duckworth and shows a very sad, but an often accurate representation of how social media is considered in schools and amongst some parents. How often do we think we don't want to teach or discuss social media in classes because our kids aren't really using it? My students are too young, they can't have an account yet anyways. I have spent the last eight years teaching 4th- and 5th-graders (ages 10-12) and many of my students have in fact had social media accounts, even though all of them were under 13 years old, the typical age required for many social networks to have accounts. 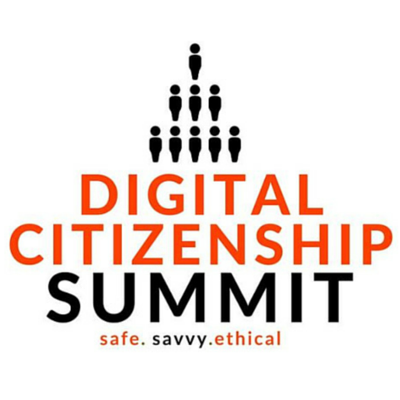 We need more Digital Citizenship, not less! 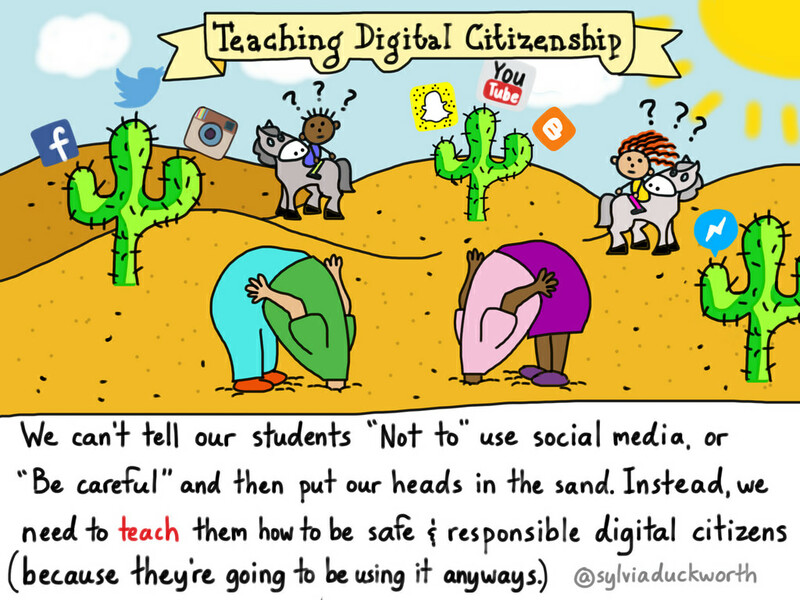 We can't sit by and assume someone else is going to teach our students how to properly use social media because that's no better than putting our heads in the sand. 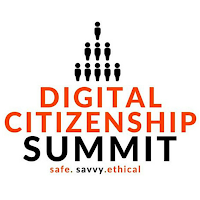 When I was at the #DigCitSummitUK in January, someone there mentioned the idea that if we taught driver's education classes the same way we teach Digital Citizenship then our students would all sit in a lecture hall for a short "lesson" on how to drive before being handed a license on their way out of the lecture hall. Is that how we teach driver's education classes? Not a chance! We have students go through a number of classes followed by many different practice scenarios that ultimately lead to many months of practice before allowing them to receive their actual license. And yet we assume a couple of short lessons on how to be safe and good citizens online is enough? Have you looked at Facebook or Twitter lately? Have you seen the garbage that adults are publishing as an example to their children and youth around them? We need to do everything in our power to include MORE Digital Citizenship in schools, not less. We should be allowing students to practice social media skills regularly, while under the supervision of educators and school officials as frequently as possible, if not daily during their time in the K-12 system. Does that mean they won't ever make mistakes? That they won't ever have a problem? 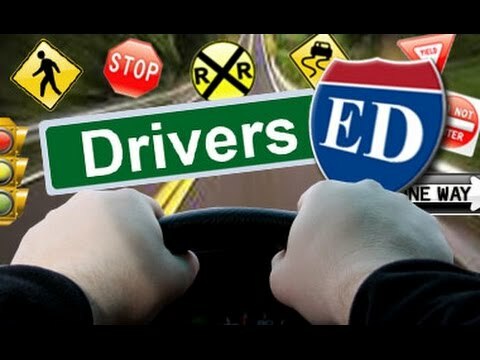 Does the current driver's education system completely erase all traffic violations and accidents from our roads? Hopefully, this issue many people have with students using and practicing social media in schools and classrooms can be calmed because we are missing out on YEARS of practice for helping our youth become more mature in their digital selves. Find a way to get your head out of the sand, or help others remove their heads, so we can all work together to better educate our students on proper social media and digital usage. We nee to find ways to better teach Digital Citizenship into our lessons, both at home and school. We need to Be the Digital Change we hope to see in the world!